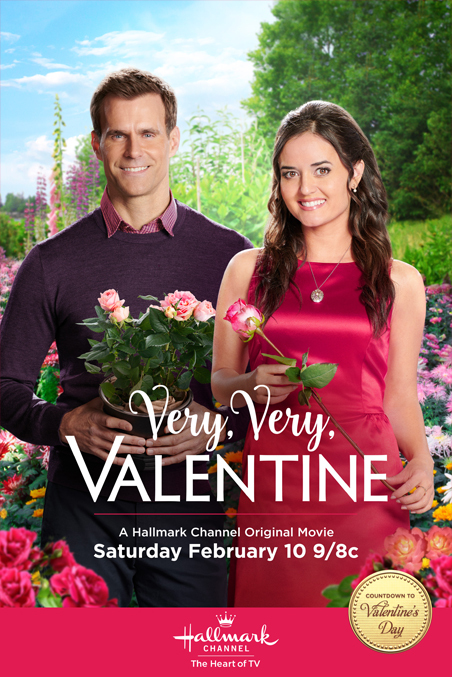 Last night Hallmark Channel continued its Countdown to Valentine’s series with another delightful romantic movie Very, Very Valentine. The movie premiered at 9 p.m. Eastern (8 p.m. Central) on Saturday, February 10, 2018. The movie's lead stars are Hallmark favorites Danica McKellar and Cameron Mathison. If you've missed the movie last night, you can watch the encore presentations on February 11 at 7 p.m. Eastern, February 14 at 6 p.m., February 17 at 5 p.m., February 18 at 1 p.m., February 19 at 6 p.m., and March 8 at 4 p.m.
Helen, a kind hearted and shy florist, meets the perfect man at a Valentine’s Masquerade Ball. She enlists the help of her best friend Henry to track him down.” Another synopsis reads: Helen works in a flower shop and her best friend Henry at the botanical gardens. At a masquerade gala, she thinks a masked man is Henry but he’?s actually off working. Enchanted by the dashing stranger, Helen is disappointed when he abruptly races off, dropping his rose boutonniere. Love-struck, she recognizes the rose and goes out in search of the man. Danica and Cameron appear as Helen and Henry respectively in the movie. Danica has given her notable roles to other television series and movies like The Wonder Years, The West Wing, Dancing with the Stars, The Wrong Woman, Perfect Match, Crown for Christmas, My Christmas Dream, Wedding Bells, and Campfire Kiss. Recently, Danica starred on Hallmark’s film Coming Home for Christmas. Meanwhile, Cameron is best known for his role as Ryan Lavery on All My Children. He has co-anchored a few TV shows, including Good Morning America, Entertainment Tonight, and 35th Annual Daytime Emmy Awards. Damon Runyan (Charles), Mary Long (Aunt Carol), Andrea Runge (Beth), Howard Hoover (Mr. Grey), M.E. Lewis (Pastor Evans), Steffan Brogren (Mr. Carlisle), Jorja Cadence (Sarah), Jill Frappier (Judie), Catherine McGregor (Tina), Rhyswyn Trenhaile (Peter), Michael Gordin Shore (Charles), and Ryan Laplante (Vendor).